It’s March and already the chirps of winter birds have changed to songs that attract mates and define territories. Soon the migratory birds will be arriving to join them and begin their yearly nesting ritual. Back yard birders can help ensure the success of the next generation of wild birds by providing the five nesting-specific needs recommended by Duncraft. It’s March and already the chirps of winter birds have changed to songs that attract mates and define territories. Soon the migratory birds will be arriving to join them and begin their yearly nesting ritual. Back yard birders can help ensure the success of the next generation of wild birds by providing five nesting-specific needs. Nesting boxes and shelves: Putting up nesting boxes gives cavity dwellers, those birds who would otherwise nest in natural holes in trees or in old woodpecker holes, a place to nest where trees are scarce. Different birds are attracted to different types of housing. 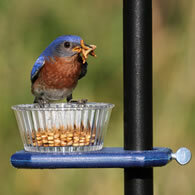 Duncraft offers a complete Guide to bird house types and placement on Duncraft’s Wild Bird Blog. Nesting shelves suit birds who don’t nest in cavities, but rather, build open cupped nests attached to branches of trees or in the crotches of limbs. Robins and doves are two birds that readily use nesting shelves. Tree snags: When taking down dead trees, it’s desirable to leave the majority of the trunk, as long as it doesn’t pose a danger. Woodpeckers are a primary cavity excavator and will use these snags to hollow out nesting areas. Although woodpeckers will not reuse a cavity the next year, these holes become prime nesting locations for smaller cavity nesting birds such as chickadees, nuthatches, wrens and others. Nesting materials: Putting out nesting materials such as cotton, moss, string and animal hair eases the nest-building process and may also help keep inappropriate materials such as plastic out of the nest.